Drum and Bass MC turned singer songwriter Billy Rowan, aka The Undercover Hippy, is definitely not your average singer songwriter. His music brings together soulful vocals, infectious reggae rhythms, and the lyrical delivery of a skilled mc. Starting out as a solo act in 2007, he has since teamed up with some fantastic musicians and performs as a four piece, mixing guitars, keys, drums, bass, and backing vocals to create a high energy, interactive and highly entertaining live show. Combining intelligent, provocative lyrics with dangerously catchy hooks and a feel-good groove, this is music for the thinking man to shake his arse to. Think Natty meets Eminem…on a protest march…at the Edinburgh Fringe. Renowned for the electric atmosphere of their live shows, Billy and his band have performed at some of the UK’s best festivals, including Glastonbury, Boomtown Fair, Shambala, Green Man, The Secret Garden Party, Ireland’s Electric Picnic, and many more. 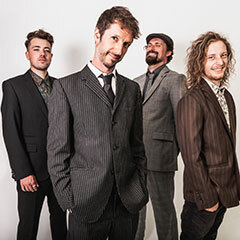 As their last album Monkey Suit, released in late 2014, continues to clock up over a million streams and sales, the band have been touring relentlessly, with over 80 shows and festival appearances across the UK and Europe each year. At the end of 2016 the band took a step back from touring to focus on recording the new album “Truth & Fiction”. Working with producer and engineer Dean Forrest (Backbeat Soundsystem, Easy Star Records) at Cube Studios in Cornwall, they laid down the groundwork for what they consider to be their most accomplished piece of work to date. Billy then worked with grammy nominated mix engineer Dean Barratt (Natty, Shy FX, Anoushkar Shankar) to refine and finally mix the tracks at the Dairy Studios in Brixton, and the album was released in May 2017. Since then it has received a fantastic response from both fans and critics alike. Tracks from the album have received airplay on David Rodigan’s show on BBC 1Xtra, and Tom Robinson has played tracks on both the BBC Introducing Mixtape and the Tom Robinson Show on 6Music. One of Billy’s biggest strengths is the way he manages to pack his songs full of political and social commentary, whilst at the same time remaining playful and uplifting, and in this respect the new album does not disappoint. Covering topics from fake news, internet privacy and the U.S. election, to nappy wearing barristers and best friends trying to snog your mum, this album once again takes you on a rollercoaster of storytelling and thought-provoking protest pieces.